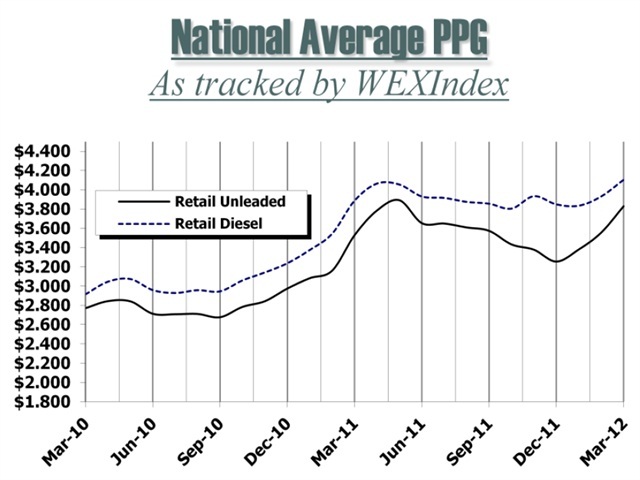 WEXIndex Retail Fuel Price Index is a monthly publication produced by Wright Express with market insights provided by OPIS Energy Group. ® Copyright 2012, Wright Express Corporation, 97 Darling Avenue, South Portland, ME 04106. Reproduction without permission is strictly prohibited. Wright Express’ latest WEX Index report shows gas prices are still rising, with more than 25% of stations in the U.S. with prices at more than $4 per gallon. The national average price for gasoline at retail is $3.94 per gallon. Last month the national average retail price for unleaded was $3.55. In addition to the highest prices, on a regional basis the low end for pricing is up as well, at $3.57 in Wyoming, compared with $3.12 in late February/early March. Wright Express stated that more than 6% of all stations are pricing gasoline at more than $4.25 per gallon. 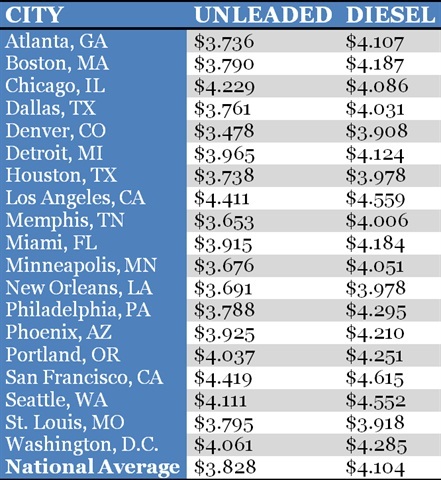 By comparison, last year only 1% of gas stations had prices at $4.25 per gallon. Analysts see prices increasing in the next few weeks, possibly breaking the record set in July 2008 by the end of April, but don’t believe the rally will continue unless geopolitical events in oil-producing countries, or other events, cause a supply disruption of some kind. Wright Express said analysts expect prices to start dropping by May. According to the company, past price drops during the spring months average about 16%. In addition, the U.S. Department of Energy said demand is off by 6-7%. One factor that will increase prices that Wright Express noted is county regulations requiring the use of reformulated gasoline, especially in the northeast. Refinery closures in that region are causing supply concerns, according to the company. For last month’s report, click here.